This article describes a simple Inverted L for the HF bands. To achieve reasonable performance down to 80m, the wire needs to be longer than about 35% of a wavelength or 30m. A suitable pair of supports which could accommodate about 27m of wire were identified. With 27m as a starting point, NEC models were created for an Inverted L with a 7.7m vertical section to a suitable anchor point on the mast, and 19m in the horizontal top leg. The model was examined for reasonable performance down to 80m, and avoidance of high driving impedances in any amateur bands. Although this configuration was fine for the existing HF bands, it resulted in a very high driving voltage in the 5.0 to 5.5MHz region. In the hope that we may get some channels in this area, the top section was reduced to 17.5m to shift the first parallel resonance up to about 6MHz. The antenna was then constructed and resonances checked against the model for model verification / calibration, and a bulk loss resistance was added to the model to calibrate model results to measured load impedance at the first series resonance. The calibrated model was rerun and the results appear in the tables and figures below. Table 1 shows the modeled feedpoint impedance on the HF amateur bands, the settings and loss for an L-match tuner, and feedpoint voltage at 100W it can be seen that a 25m wire is barely adequate for reasonable performance on 80m, and definitely lacking in performance on 160m. The Icom AH-4 tuner manual requires avoidance of half wave lengths of radiator, suggesting that it subjects the tuner to excessive voltage. Figure 1 is a plot of the modeled feedpoint voltage over the HF range. The voltage climbs rapidly below 3MHz (which is the quarter wave resonance of the wire), and peaks at the parallel resonances at 6MHz and multiples of that frequency. The 6MHz resonance results in around 1KV at the feedpoint for 100W, subsequent peaks are successively lower. I am a loss to understand why the advice in the user manual, especially given that the feedpoint voltage on a 6m vertical at 3.5MHz (recommended minimum in the manual) is around 6KV. Nevertheless, I defer to their advice, and have selected a wire length that avoids operation in excess of 2KV on any of the amateur bands. 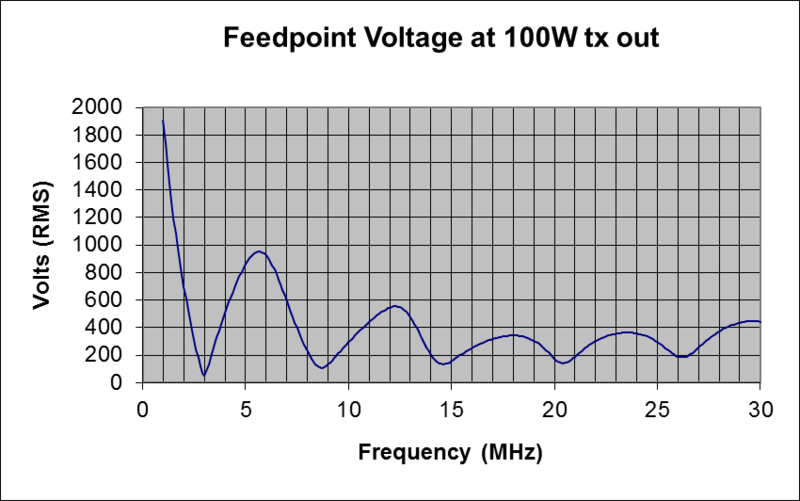 Figure 1: Feedpoint voltage over the HF range. 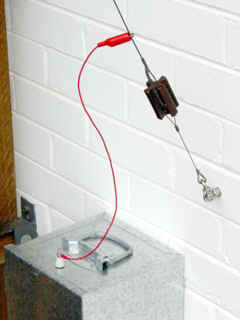 The L-match model used a capacitor Q of 2000, and inductor Q of 100 at 1MHz and proportional to the square root of frequency. I note that many estimators of such a network use a constant inductor Q, and others make it proportional to frequency. Since inductive reactance is proportional to frequency, and skin effect causes coil resistance to be proportional to the square root of frequency, and Q is Xl/R, then it seemed to me that the best model for this situation was to make Q proportional to f/f^0.5 or the square root of frequency. This is a more relevant issue at low frequencies and for larger inductances. In general, tuner loss is not an issue except at the very low frequencies where the load has low resistance and high capacitive reactance, requiring a large tuning inductance with attendant high series resistance operating at high current increasing the inductor losses markedly. The AH-4 is not rated for use on 1.8MHz and in the event will not tune the load. Indicated loss for an L-match on 1.8MHz is 0.6dB, at which 13% of the transmitter power is dissipated in the tuner inductor and which would be of concern. On the bands that are within the specification for the AH-4, worst case loss is less than 0.15dB or 3.5%. Figure 2: L-match tuner loss. I do not expect that T-match tuner will generally perform as well as the L-match figures above, especially for the very popular models with small capacitors (250pf or less) at low frequencies. Initial modeling indicates around 2.2dB of loss to T-match at 1.8MHz and 0.4dB at 3.6MHz. A significant issue is that on 1.8MHz with such a T-match, 40% of the transmitter power is dissipated in the tuner inductor which may well damage the inductor. Nevertheless, indications are that a T-match would probably be satisfactory on 3.6MHz and higher bands. When I get a few spare moments, I will write a program to auto-tune and analyse a T-match and include the results. Figure 3 shows the modeled EIRP over the HF range. The antenna performance is good over the range 40m to 10m, and tolerable on 80m, but 160m is seriously low due mainly to low feedpoint resistance relative to the earth resistance, and the tuner losses in matching such a low resistance. Figure 4 reveals the major components of antenna system gain. The upper curve is the radiator gain is as modeled at 45° elevation for the major lobe. Tuner and earth system losses both subtract from the radiator gain to give the overall antenna system gain at the lower edge of the green area. Tuner losses do not contribute much to the outcome, but earth system losses become very significant below 5MHz, 3dB at 3.6MHz, and rising to almost 8dB at 1.8MHz. Figure 4: ESR over the HF range. For the reasons stated earlier, the loss of the earth system has been modeled as a bulk resistance of 15 ohms at the base of the radiator. The earth system resistance is significant at low frequencies where the ESR of the antenna is very low. Figure 4 shows the modeled equivalent series resistance (ESR) or the radiator (excluding earth system resistance) over the HF range (note the logarithmic scale). The ESR is a little low in the 80m and 30m bands, and is very low in the 160m band. The wire is 2mm diameter hard drawn copper. Increasing the wire diameter substantially made little difference to the gain in the EZNEC models, so wire loss is discounted as insignificant. Matching network loss is significant on the very lowest band, and typical losses for a practical L-match are shown in Table 1. The intention is to match the antenna to the feedline at the base of the antenna. In that circumstance, the transmission line runs matched, and the length of 4m of RG58 has insignificant loss (<0.32dB) over the whole HF range. Use of a wire in non-resonant mode with an ATU provides frequency agility. The Icom AH-4 provides very convenient frequency agility, and being remote, it avoids the need to bring the radiator into the shack to attach to a matching network. A manual L-match tuner is less convenient, especially if located outside the shack, but quite effective. The EZNEC model is available for download. The following illustrates the physical implementation with some accompanying notes. A view upwards to the corner of the Inverted L. The vertical section is inclined slightly to the feedpoint. 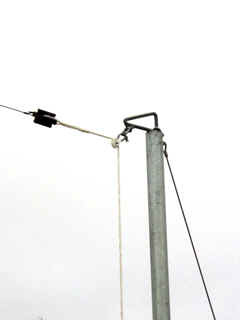 A view upwards to the end of the horizontal section of the Inverted L. The element is supported on a length of 40mm NB galvanised water pipe, with a small fabricated gibbet, block and halyard, and a 4mm FSWR backstay to resist the bending moment caused by the wire tension. 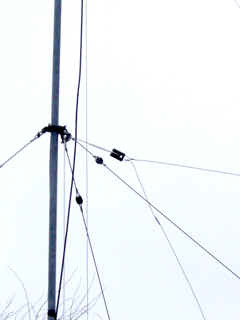 The lower end of the vertical section is anchored to the wall, and a wander lead used to attach the tuner to the antenna. When not in use, the wander lead is disconnected to reduce the risk of lightning damage. The tuner is housed in an inexpensive galvanised steel toolbox to protect it from the sun. The earth system used initially is a system installed principally for lightning protection, and will not be and ideal RF earth for HF. Plans are to augment that earthing system with some shallow buried bare radial wires when enough rain falls to soften the ground so that a spade can be inserted... but it doesn't rain in Canberra anymore! The antenna is designed for the low HF bands, with reduced performance on 80m and performance comparable to a dipole on 80m to 30m. At the higher bands, the pattern will break up into a complex set of maxima and minima that will result in variable performance depending on the radiation angle and azimuth of particular radio circuit paths. The models show that the antenna is frequency agile, and is designed to avoid low mode parallel resonances (on any low bands) for the purpose of keeping ATU operating voltages low. Parallel resonances at higher modes are less an issue, and the impedance of higher mode parallel resonances is lower and the resultant voltages are tolerable. The antenna works very well on 80m, 40m, 30m and 20m. Signal reports, both received and sent have been in accord with expectations and compare very favourably with other stations over the same path at the same times. Tests on 40m have also included comparison against an Inverted V Dipole. The antenna was not designed for 160m because the AH-4 tuner is not specified for operation at that frequency. Nevertheless, it is worth considering what the lower performance limit of the antenna is, and why it is so. Performance tapers off below about 5MHz, being about 6dB down at 3.6Mhz. There is no doubt that the performance of this antenna could be improved by perhaps up to 6dB at 1.8MHz by substantial enhancement of the earth system to reduce its resistance from 15 ohms to 4 ohms. Similar gains could be achieved by doubling the length of the radiator which would increase its series resistance from 3 ohms to 15 ohms. Doing both would be an even greater improvement.